Food52 Genius Desserts: 100 Recipes That Will Change the Way You Bake (Food52 Works) est le grand livre que vous voulez. Ce beau livre est créé par Kristen Miglore. En fait, le livre a 288 pages. The Food52 Genius Desserts: 100 Recipes That Will Change the Way You Bake (Food52 Works) est libéré par la fabrication de Ten Speed Press. Vous pouvez consulter en ligne avec Food52 Genius Desserts: 100 Recipes That Will Change the Way You Bake (Food52 Works) étape facile. Toutefois, si vous désirez garder pour ordinateur portable, vous pouvez Food52 Genius Desserts: 100 Recipes That Will Change the Way You Bake (Food52 Works) sauver maintenant. In this follow-up to the IACP award-winning, New York Times best-selling cookbook Genius Recipes, Food52 is back with the most beloved and talked-about desserts of our time (and the under-the-radar gems that will soon join their ranks)—in a collection that will make you a local legend, and a smarter baker to boot. Drawing from her James Beard Award-nominated Genius Recipes column and powered by the cooking wisdom and generosity of the Food52 community, creative director Kristen Miglore set out to unearth the most game-changing dessert recipes from beloved cookbook authors, chefs, and bakers—and collect them all in one indispensable guide. This led her to iconic desserts spanning the last century: Maida Heatter’s East 62nd Street Lemon Cake, François Payard’s Flourless Chocolate-Walnut Cookies, and Nancy Silverton’s Butterscotch Budino. But it also turned up little-known gems: a comforting Peach Cobbler with Hot Sugar Crust from Renee Erickson and an imaginative Parsnip Cake with Blood Orange Buttercream from Lucky Peach, along with genius tips, riffs, and mini-recipes, and the lively stories behind each one. The genius of this collection is that Kristen has scouted out and rigorously tested recipes from the most trusted dessert experts, finding over 100 of their standouts. Each recipe shines in a different way and teaches you something new, whether it’s how to use unconventional ingredients (like Sunset’s whole orange cake), how to make the most of brilliant methods (roasted sugar from Stella Parks), or how to embrace stunning simplicity (Dorie Greenspan’s three-ingredient cookies). 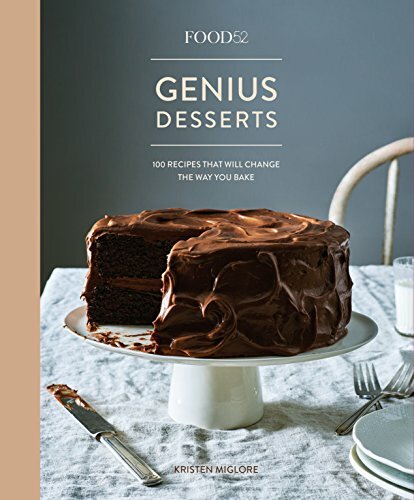 With photographer James Ransom’s riveting images throughout, Genius Desserts is destined to become every baker's go-to reference for the very best desserts from the smartest teachers of our time—for all the dinner parties, potlucks, bake sales, and late-night snacks in between.